Explanation: The 2003 Leonids Meteor Shower contained relatively few meteors. As expected and unlike the last few years, the Earth just did not pass through any dense particle streams left over by the Sun-orbiting Comet Tempel-Tuttle. 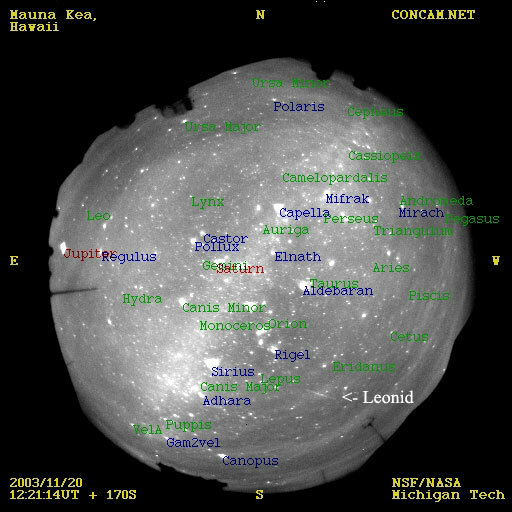 Preliminary reports had the peak meteor rates only as high as about one relatively faint meteor a minute even from good locations at good times. Pictured above is one of the brighter Leonids of 2003, caught by one of the continuously operating night sky web cameras (CONCAMs) of the global Night Sky Live project. The fisheye image shows the night sky from horizon to horizon above Mauna Kea, Hawaii, USA. The image is annotated with several bright stars and planets. Note that this meteor, as do all Leonids, appears to emanate from the constellation Leo, labeled on the upper left. Although the peak of the Leonids this year was on November 19, this meteor flashed through the sky the next night.